TH E M R EP O RT | 39 Special Advertorial Section TECHNOLOGY COMPANY GUIDE KEY PERSONNEL Keith Guenther Founder and CEO Rob Pajon SVP- Marketing & Product Angela Hurst SVP- Business Development STAFFING Employees: 110 CONTACT INFORMATION 25520 Commercentre Drive, Floor 1 Lake Forest, CA 92630 Phone: 800.760.7036 Email: support@res.net Web: RES.NET.com RES.NET COMPANY PROFILE RES.NET is a leader in today's real estate technology and offers an all-encompassing servicer technology suite including REO, loss mitigation, and valuation enterprise applications for the mortgage banking Industry. 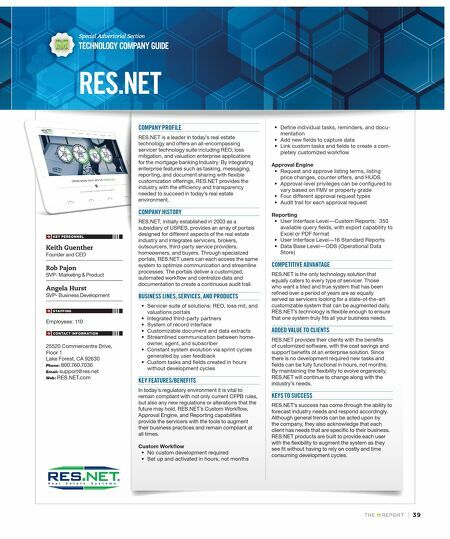 By integrating enterprise features such as tasking, messaging, reporting, and document sharing with flexible customization offerings, RES.NET provides the industry with the efficiency and transparency needed to succeed in today's real estate environment. COMPANY HISTORY RES.NET, initially established in 2003 as a subsidiary of USRES, provides an array of portals designed for different aspects of the real estate industry and integrates servicers, brokers, outsourcers, third-party service providers, homeowners, and buyers. Through specialized portals, RES.NET users can each access the same system to optimize communication and streamline processes. The portals deliver a customized, automated workflow and centralize data and documentation to create a continuous audit trail. BUSINESS LINES, SERVICES, AND PRODUCTS • Servicer suite of solutions: REO, loss mit, and valuations portals • Integrated third-party partners • System of record interface • Customizable document and data extracts • Streamlined communication between home - owner, agent, and subscriber • Constant system evolution via sprint cycles generated by user feedback • Custom tasks and fields created in hours without development cycles KEY FEATURES/BENEFITS In today's regulatory environment it is vital to remain compliant with not only current CFPB rules, but also any new regulations or alterations that the future may hold. RES.NET's Custom Workflow, Approval Engine, and Reporting capabilities provide the servicers with the tools to augment their business practices and remain compliant at all times. Custom Workflow • No custom development required • Set up and activated in hours, not months • Define individual tasks, reminders, and docu- mentation • Add new fields to capture data • Link custom tasks and fields to create a com- pletely customized workflow Approval Engine • Request and approve listing terms, listing price changes, counter offers, and HUDS • Approval-level privileges can be configured to vary based on FMV or property grade • Four different approval request types • Audit trail for each approval request Reporting • User Interface Level—Custom Reports: 350 available query fields, with export capability to Excel or PDF format • User Interface Level—16 Standard Reports • Data Base Level—ODS (Operational Data Store) COMPETITIVE ADVANTAGE RES.NET is the only technology solution that equally caters to every type of servicer. Those who want a tried and true system that has been refined over a period of years are as equally served as servicers looking for a state-of-the-art customizable system that can be augmented daily. RES.NET's technology is flexible enough to ensure that one system truly fits all your business needs. 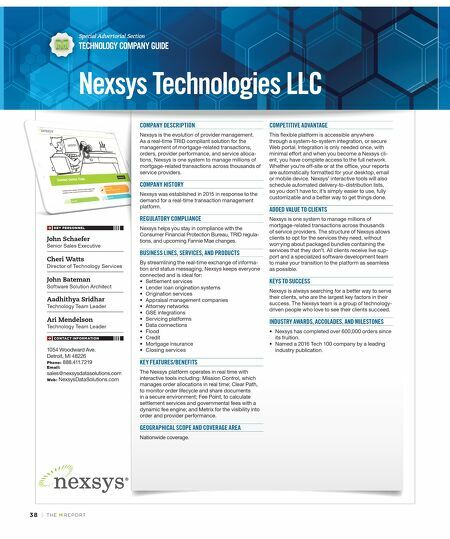 ADDED VALUE TO CLIENTS RES.NET provides their clients with the benefits of customized software, with the cost savings and support benefits of an enterprise solution. Since there is no development required new tasks and fields can be fully functional in hours, not months. By maintaining the flexibility to evolve organically, RES.NET will continue to change along with the industry's needs. KEYS TO SUCCESS RES.NET's success has come through the ability to forecast industry needs and respond accordingly. Although general trends can be acted upon by the company, they also acknowledge that each client has needs that are specific to their business. RES.NET products are built to provide each user with the flexibility to augment the system as they see fit without having to rely on costly and time consuming development cycles.